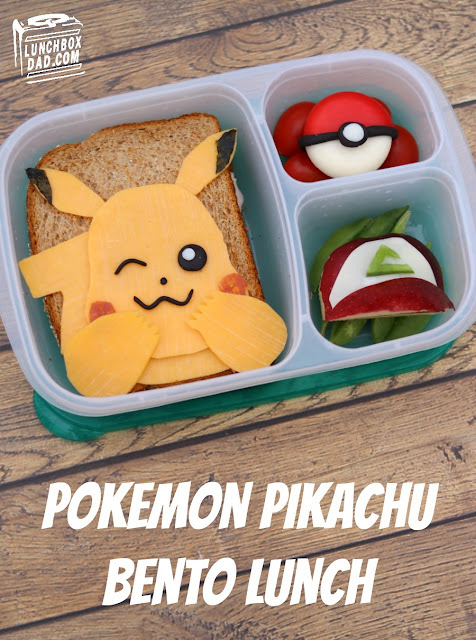 Lunchbox Dad: A Pokémon Pikachu Lunch! Gotta Collect All the Sandwiches! 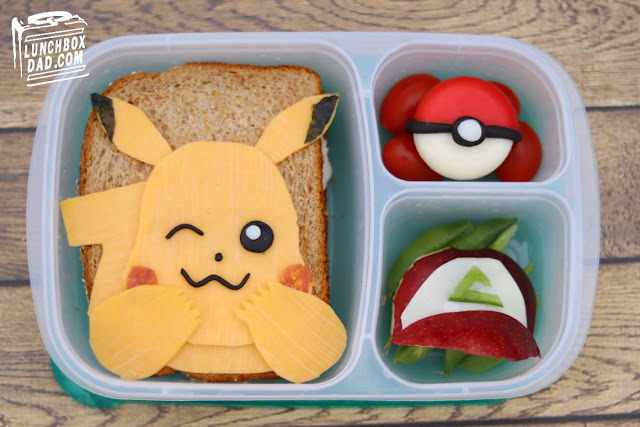 A Pokémon Pikachu Lunch! Gotta Collect All the Sandwiches! This summer Pokémon Go took the world by storm. However, it didn't just capture the world's attention, it captured my son's attention. He had already started trading Pokémon cards with his friends and this came along. Then he heard about the Nintendo 3DS games, Pokémon Sun and Moon, and of course he wanted them. So let's just say that at times he has been a bit obsessed. He has been requesting a Pokémon lunch for months, so it's pretty clear that it was long overdue. I honestly didn't start thinking about this one until two days ago so it came together pretty fast. Honestly the ingredients were really easy to come by, so it made the creation pretty simple. I built the lunch in an Easy Lunch Boxes container. Read below to see how I made it and how you can make this lunch for your kids as well! Ingredients: Whole wheat bread slices, turkey slices, cheddar cheese, pepperoni, nori, black and white Wilton's Shape N Amaze edible modeling dough, Babybel cheese round covered in red wax, grape tomatoes, red apple, white cheese, snap peas. 1. Place turkey between two slices of bread. Cut cheddar cheese, nori for ears, and pepperoni for cheeks into pieces as shown in the picture below. 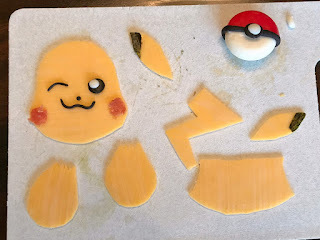 Also, mold edible modeling dough into facial features for Pikachu. Assemble pieces on top of sandwich and put in main compartment of lunchbox. 2. Peel half of the red wax off of Babybel cheese round. Mold black edible modeling dough into a string shape with a circle on top. Place white edible modeling dough circle on top of black circle. 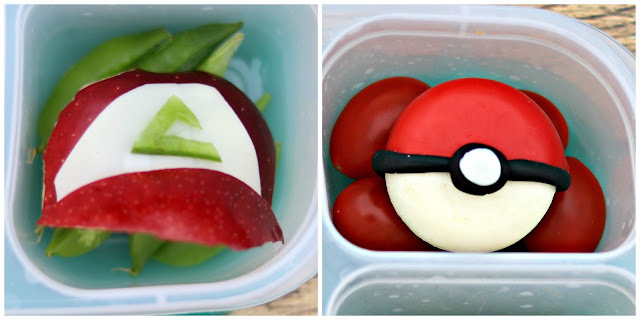 Wrap around Babybel cheese round to create Pokeball. Drop grape tomatoes in side compartment and put Pokeball on top. 3. Cut red apple in half and then cut two pieces to make the front and the brim of Ash's hat. Cut a triangle of white cheese and place on top of front of hat. use toothpicks to hold brim on. Cut the green triangle design from a snap pea. Use a toothpick to hold on top of white cheese. Put snap peas in side compartment and place apple hat on the peas.